Monte, E.; Garcia-Rigo, A.; Hernandez, M.; Yang, H.
In this paper, we present a method for forecasting the ionospheric Total Electron Content (TEC) distribution from the International GNSS Service’s Global Ionospheric Maps. The forecasting system gives an estimation of the value of the TEC distribution based on linear combination of previous TEC maps (i.e., a set of 2D arrays indexed by time), and the computation of a tangent subspace in a manifold associated to each map. The use of the tangent space to each map is justified because it allows modeling the possible distortions from one observation to the next as a trajectory on the tangent manifold of the map. The coefficients of the linear combination of the last observations along with the tangent space are estimated at each time stamp to minimize the mean square forecasting error with a regularization term. The estimation is made at each time stamp to adapt the forecast to short-term variations in solar activity. 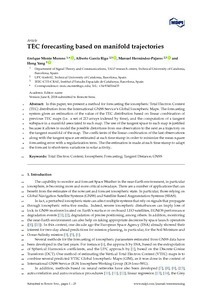 Monte, E., Garcia-Rigo, A., Hernandez, M., Yang, H. TEC forecasting based on manifold trajectories. "Remote sensing", 22 Juny 2018, vol. 10, núm. 7, p. 988-1013.